Ncell Private Limited has been connecting Nepal since 2004. Contributing to the vision of Digital Nepal and development of the country’s economy and infrastructure, Ncell’s best-in-class network brings communication services to people living in the most remote areas of Nepal. 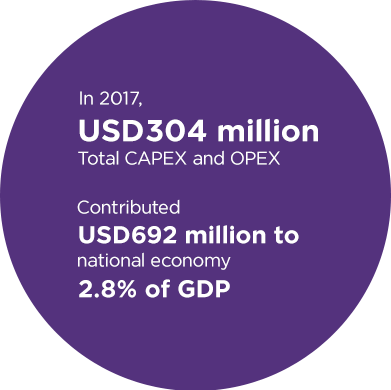 The Nepalese economy witnessed a broad-based rebound in 2017 as it recovered from the 2015 earthquakes. Inflation was moderate, government revenue and spending increased, and remittances grew. In FY2017, the Nepalese economy grew at 7.5% and public spending reached a record high of 8% of GDP. Through the Department of Information Technology, the Nepalese government has implemented numerous projects aimed at addressing local developmental challenges through the digitisation of services. These projects were implemented and accelerated in efforts to rebuild after the devastating earthquakes in 2015.